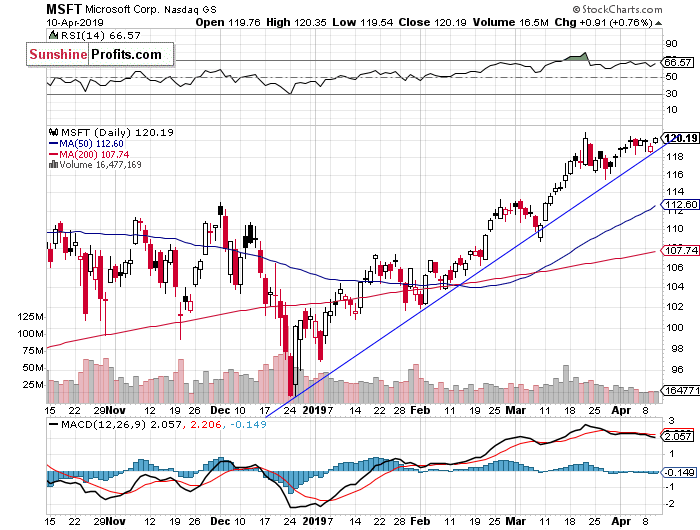 Stocks retraced some of their Tuesday’s decline yesterday, as they continued to fluctuate following the recent rally. The S&P 500 index traded slightly below the 2,900 mark. 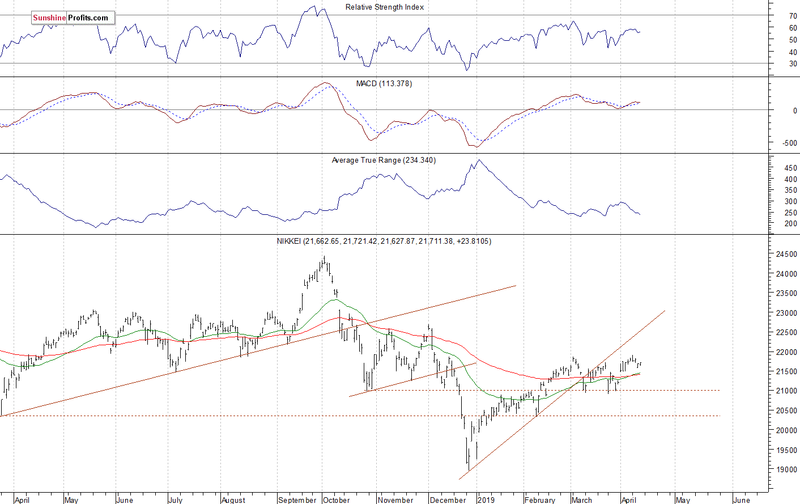 Will the uptrend continue despite some technical overbought conditions? The U.S. stock market indexes were mixed between 0.0% and +0.7% on Wednesday, as investors hesitated following Tuesday’s decline. The S&P 500 index retraced more of its October-December downward correction of 20.2% on Monday. The broad stock market's gauge is now just 1.8% below September the 21st record high of 2,940.91. 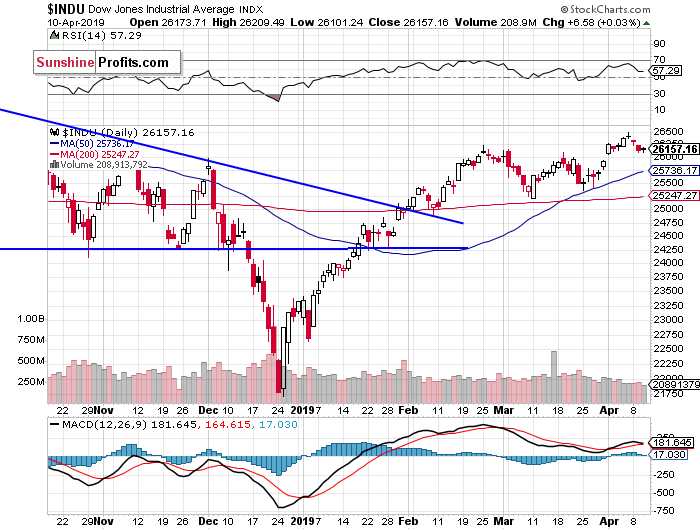 The Dow Jones Industrial Average was unchanged and the Nasdaq Composite gained 0.7% on Wednesday. The nearest important resistance level of the S&P 500 index remains at 2,890-2,900, marked by some early October local highs. The next resistance level is at 2,920-2,940, marked by the mentioned record high, among others. On the other hand, the support level is at 2,860-2,865, marked by the recent local lows. 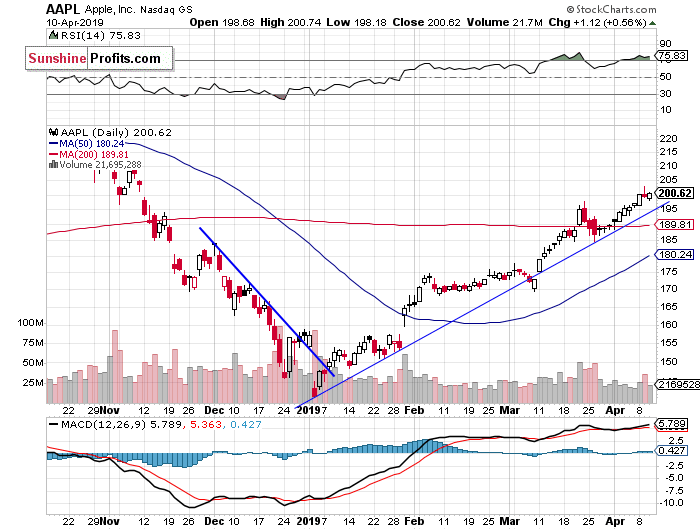 The support level is also at 2,835-2,850, marked by the previous Monday’s daily gap up of 2,836.03-2,848.63. Expectations before the opening of today's trading session are slightly positive, because the index futures contracts trade 0.1-0.2% above their Wednesday’s closing prices. The European stock market indexes have gained 0.2-0.8% so far. Investors will wait for some economic data announcements: Producer Price Index, Unemployment Claims at 8:30 a.m. There will also be several speeches from the FOMC Members today. 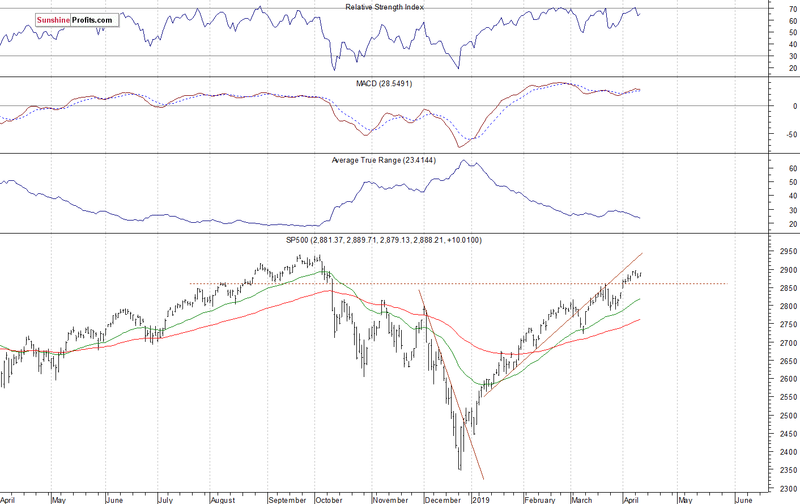 The broad stock market will likely continue to fluctuate following the recent rally. There have been no confirmed negative signals so far. 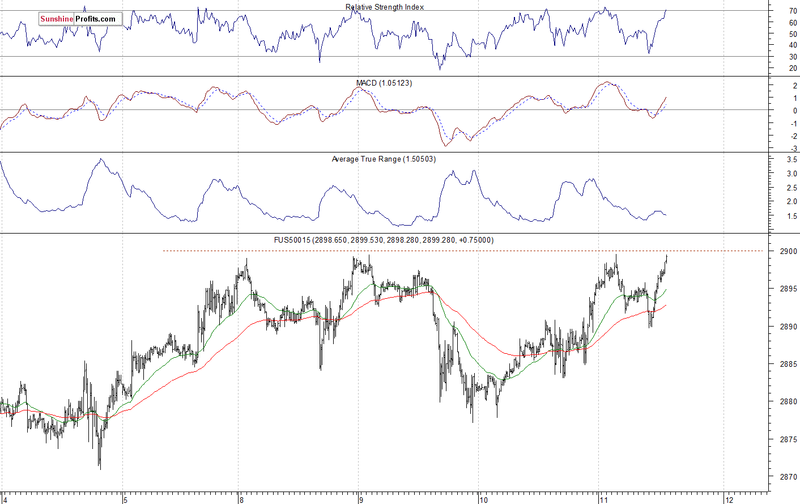 The S&P 500 index slightly extended its short-term uptrend on Monday, as it got the highest since the early October. 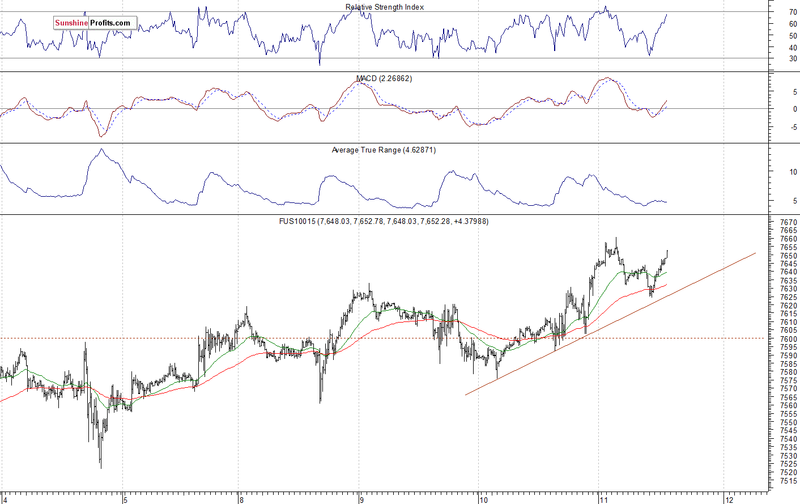 But on Tuesday it retraced some of the advance, after bouncing off a potential 2,900 resistance level. For now, it looks like a short-term downward correction. Concluding, the S&P 500 index will likely open slightly higher today. We may see an attempt at breaking above the 2,900 mark. However, there may be some short-term uncertainty, as stocks trade close to their medium-term resistance level and their September’s record high. If you enjoyed the above analysis and would like to receive free follow-ups, we encourage you to sign up for our daily newsletter – it’s free and if you don’t like it, you can unsubscribe with just 2 clicks. If you sign up today, you’ll also get 7 days of free access to our premium daily Gold & Silver Trading Alerts. Sign up today!